It’s time to talk about subscription box marketing. So you have been completely won over by the benefits of the recurring payment model that a subscription commerce business brings. You have followed our tips on how to start a subscription box business, you have chosen your products to sell and you have set up your Subbly website. Let the sales roll in right? Well, unfortunately it isn’t that simple because no matter how awesome your subscription box may be, nobody knows about it yet! This is where the hard work starts. It isn’t easy and it takes time, but if you are smart, patient and follow our advice, visitors will be flocking to your website in no time, and those recurring revenues will start rolling in. You can get early feedback on your product which you can use to then iterate and improve the product and service. It is all about applying the lean principles at this stage. Setting up pages on Facebook and Twitter is a no brainer right. Invite your friends to like your page. Retweet some famous faces. Share some status’ telling the world about your product and again the sales will roll in right? WRONG AGAIN! Just like setting up your website, your social media presence requires much more strategic and smart tactics. It isn’t just a case of creating profiles and sharing a status here and there. Your social strategy could be your most powerful channel for creating customer awareness, driving traffic and gaining subscribers to your product. 1. Reach out to Influencers: Getting a retweet from somebody on social media is nice. But when that person only has 12 friends there isn’t a whole lot of value in it. Not that you should discard this person. You should very much make friends with all potential customers, but focusing on being friends and adding value to the influencers will be time much better spent. Getting a social endorsement from one of the leading players in your industry might the boost you need to raise awareness of your product. So find out who the big players are in your space and add value to them. You can use tools such as followerwonk to find twitter influencers or CircleCount to find Google+ influencers for example. 2. Become a curator of content: What value are you bringing your customers? Remember that Social media isn’t a place to hard sell to your followers. People use social media to browse content and to interact with friends. So get involved in conversation with your followers, make friends with them and give them something of value. Share other peoples and particularly the ‘influencers’ content as much as your own, share articles and your personal views on current affairs and share often. By appearing like you are an authoritative and knowledgeable figure in your space you will gain the trust of potential customers. Don’t think that you have to be on your social networks all day long either. You can use awesome social tools such as Buffer or Hootsuite to schedule posts across all of your social networks, leaving you free to work on other aspects of your subscription business. 3. Choose the right channel: Social Media strategy might not cost much money to implement but it takes a whole lot of time and we all know that time is money! So choose your social channels wisely. Where do your customers hangout? What do they want to see? Which channels convert the most? Don’t feel the need to be super players on facebook, twitter, G+, Pinterest and LinkedIn. If your subscription box is full of beautiful and visually appealing products maybe Pinterest would be a better channel to pick up customers rather than the less visual Twitter. Get the idea? Inc.com elaborates here. Remember: Use social media to build audience relationships instead of constantly trying to sell your product. As mentioned, people use social media to browse content and chat with friends. So, look at social media as ‘making friends’ with your customers. Show them something interesting. Inform them. Talk with them. Make them laugh. Once you build their trust they will slowly filter down the funnel and turn into customers. “Whoaaaa. Paid Advertising??? I am just starting out. I am a one man band. I don’t have the money to spend on Pay-per-click marketing (PPC)” Don’t worry we are not telling you to spend thousands of dollars on buying traffic. This would be the worst advice one could give to a startup. What we are saying though is to put aside a teeny tiny budget to experiment with some paid ads with Google Adwords and Facebook. Let’s say $20 a week? Set up some tests using various copy based around your targeted keywords to bring targeted traffic to your site. See which ads have the best conversion rates and keep testing. Eventually you might find that the cost per acquisition is far less than the lifetime value of a customer (CLV). If this is the case you can scale your paid advertising up to generate hot leads and grow your subscription business substantially. You need to do all you can to get word out on your product. If you are new to the game and want to get noticed you might need to throw your subscription box in the face of customers for free! Let them see how awesome it is. A ‘Try Before You Buy’ promotion so to speak. If your product rocks, you will get plenty of signups after this tactic. Remember those influencers you found during your social media strategy? Send them a box for free and ask them to promote it to their millions of followers. 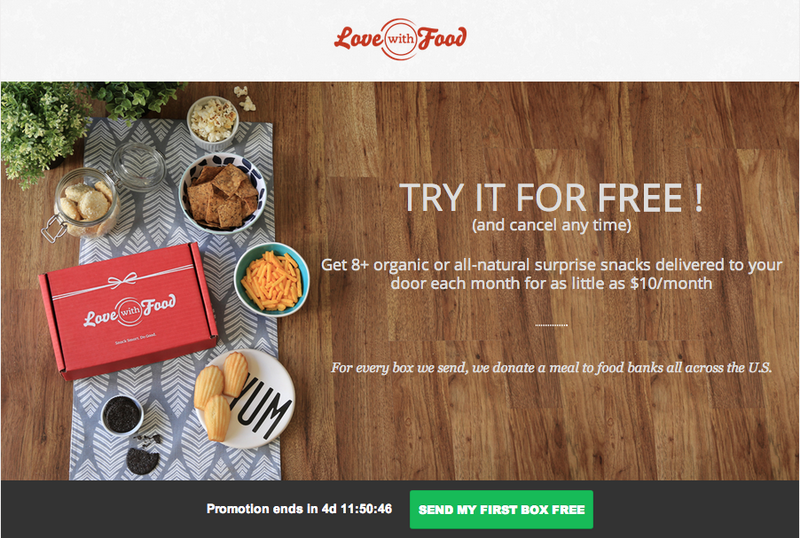 Alternatively do what LoveWithFood are doing and have a landing page promoting a Free trial. We have all heard the phrase ‘Content is King’ by now. As we mentioned above, social media is used as an inbound marketing strategy to pull in customers to your business by creating a relationship with them and offering something of value. That value should come in the form of blogging. Creating a blog that will appeal and resonate with your target audience, and then sharing across your social media networks is exactly how you will organically build a loyal community around your business. Once you have those followers on board you can aim to convert them into paying customers. Additionally, Blogging also works wonders for your SEO if you do it right. If you can rank high in Google’s search results for those targeted keywords you could be getting a bunch of organic traffic and customers too. More on this later. Buffer are a great example of a startup who have become thought leaders in their space as a result of their awesome Buffer Blog. They now get close to 700,000 visitors per month to their blog alone. Because their content is of such high quality and so useful to their customer segment, they attract qualified leads to their blog who are then more likely to go onto convert into paying customers. Remember, the better the content the more shareable it will be on social media and the higher it will be ranked by Google. So what are you waiting for? Go and inform, educate and inspire your future customers with a kickass blog. While you are creating that killer content for your own blog you also need to create it for other blogs too. 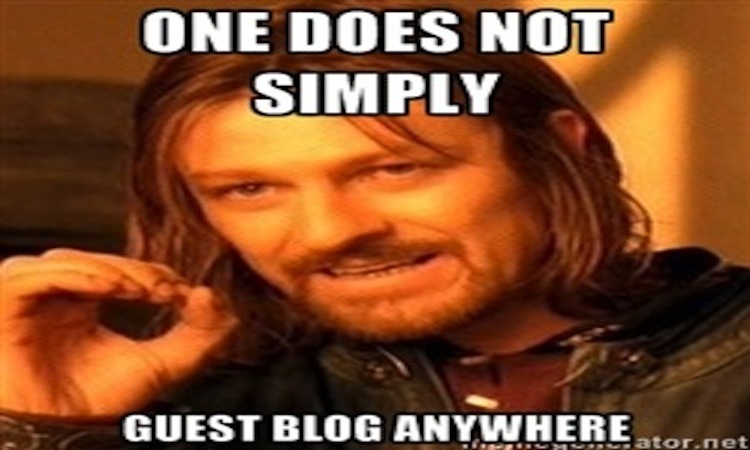 Guest Blogging was used primarily to build backlinks to a site in order to boost search engine rankings. But while it has been one of the key marketing strategies in the last few years, Google has recently clamped down on Guest Posting in order to control the amount of spammy, low quality articles across the web with many even claiming that Guest Posting is dead. But that doesn’t mean that you should avoid guest posting when starting your subscription business. Guest Posting is still a valuable way to tap into new audiences that are relevant to your niche. It is a win win situation for both you and the webmaster of the site you are posting on. The webmaster will have incredible content that will attract visitors to the site and you will expose your Subscription Box to a new audience, picking up more followers and more customers. Remember those influencers you found as part of your social strategy? Create an insane piece of content for them to put on their blog and in front of their visitors. If they decide not to use it you can always put it on your own blog. See how to head up your guest blogging campaign here with Kissmetrics ‘Ultimate Guide to Guest Blogging’. Video content is yet another channel to create a relationship with customers and a great way to increase engagement and interaction with your brand. While Video content has great SEO benefits, we all know how viral a video can go if the quality is good enough. A prime example is the Dollar Shave club subscription box whose entire business was built off the back of their genius video marketing campaign that propelled them from just a standard razor-blade company to one of the most successful subscription box businesses globally. It wasn’t a fully fledged production either. Just a single camera, and the Dollar Shave club founder Michael Dublin telling the absolute truth. Check it out here. Establishing a steady stream of visitors from scratch to your website can be difficult and time consuming. Leveraging the audiences of eBay and Amazon marketplaces could put your subscription box in front of a mass audience to help boost your sales. These marketplaces don’t have a subscription payment option so in but you should provide customers with a coupon for 10% off a purchase from your online store. This way, you can create the hook to get these customers to make their second purchase on your site and become lifelong customers. Even the big guys have a presence on Ebay and Amazon so you definitely should too. It is an easy way to gain customers with little effort. Search Engine Optimisation (SEO) is the process of making sure that search engines such as Google can find your website and rank it in search results to give you free, organic traffic. Let us make as simple as possible for you: Googlebots will come and crawl over your subbly website to figure out what it is about. Google will look at the keywords you use and will look at the quality of the content you produce and the quality of your site. Then the spider bots will notice how popular you are by seeing the amount of sites linking to you, and how many people are following you and sharing your content on social media channels. This will give Google a real indication of where to place you in it’s search results (SERPS) for certain keywords. The better the content, the better ‘high authoritative’ and ‘relevant’ sites that are linking to you, and the bigger the social media presence means higher rankings in search results and consequently more free targeted traffic and more customers! You will see now that SEO is completely interlinked with most other marketing techniques we have discussed. 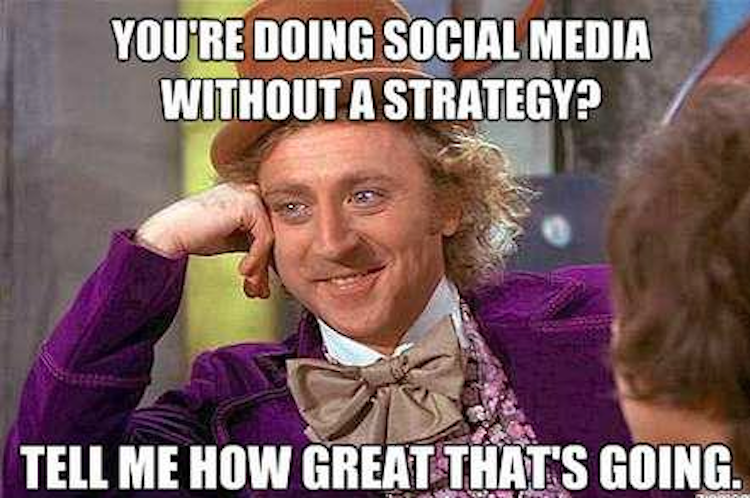 None more so than your social media strategy and your blog as we mentioned earlier. By creating new, unique, high quality blog and video content on a regular basis, it is yet another page for people to link to and another opportunity to impress Google who will reward you with higher rankings! Of course there is a real skill in optimising your site and your web presence for search engines. From choosing your keywords to rank for, to optimising your web design and site performance, there is a lot to be covered. Neil Patel’s Advanced Guide to SEO is the perfect starting point to set you on your way. Everybody loves a special offer. Remember that we are in the early stages of your subscription box business and we need every customer we can get our hands on. We need to shout it from every roof top. Creating a coupon code for customers will make them feel like they are winning. It will make them more averse to ‘trying out’ your product as they aren’t paying full price for it. It is a great way to capture a customer and making them part of your recurring revenue stream and guess what… people are obsessed with subscription boxes and coupons! Create a coupon code for your sub box like Birchbox, and share it on sites like RetailMeNot and MySubscriptionAddiction where people actively search for coupons. This might sound a like an old fashioned ‘black hat’ SEO technique to gain backlinks to your site. This is not what we mean. Use forums, and question & answer sites like Reddit and Quora to tell people about your product. Make sure that the forum or topic is completely relevant to your niche as it will be these people that may actually be interested in what you have to say. If you try to promote your ‘Beef Jerky’ product to a ‘vegetarian’ forum you will be shot down for spamming. Instead, bring value to your community, build that relationship, and you could find yourself some paying customers. Email marketing is one of the most valuable channels in the game. Having an email list of thousands of targeted customers who have all shown an interest in your product means that you can instantly contact them to promote your products. Imagine sending out an email to 100,000 potential customers telling them about your new product line. The results can be sensational and it is all free. The sooner you start collecting emails the better you will be placed in the future. Offer visitors an incentive for signing up. Perhaps a free trial, a coupon code offer, or a newsletter update to receive your awesome blog content. Mailchimp is a useful tool to store your email list and to then create an email campaign for any news and updates you want to send to your followers. These marketing tips are a surefire way to get your subscription box business off the ground and you will have your first paying customers in no time. If you want to have a sustainable, successful and profitable business however you need to apply the various strategies and be patient in seeing results. It takes time and hard work but it will be well worth it. Now that we’ve talking subscription box marketing, don’t forget to read our 9 tips to start a subscription business without the guess work to save you time, headaches and money. Don’t forget to read how to get your first 1,000 subscribers as well!